The rehabilitation and reconstruction of nearly 20 kilometers of the Third Class III-107 Road between Rila and the Rila Monastery has entered its final stage. The renovation of the section between kilometer 11+010.00 to kilometer 30+792.57 is funded through Operational Program Regions in Growth 2014-2020, the European Fund for Regional development and the Bulgarian National Budget. Currently climbers are clearing the faces of the cuttings from loose rock and installing protective mesh to secure the road from tumbling rocks and to improve traffic safety. The road marking is scheduled to go down, and the installation of flexible roadside safety barriers is nearing completion. The site will be ready to launch in days. The entire section of road has been covered by two layers of asphalt – a binding base layer and a friction-resistant top layer. The existing section of granite paving at Rila Monastery was excavated and redone. The crossroads at the village of Padala was repaired and so were all 6 major facilities part of this section, namely the bridges over the Rilska, Pastra, and Eleshnitsa rivers. As part of the project 11 kilometers of decorative walls, over 280 meters of reinforcement and about 1 550 meters of retaining walls were also built. To improve drainage, we installed soft shoulders and concrete-lined trenches, and used over 4.7 kilometers of u-channels and curbs. 8 kilometers of fencing and railings ensure the safety of the road facilities. 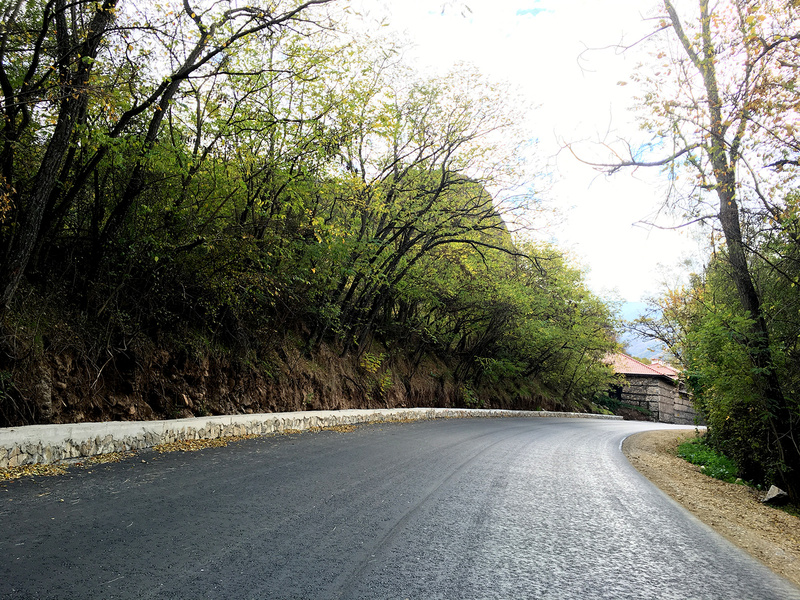 The repair work to this section of road, which is among the busiest in the country’s third-class road network, was conducted without any stoppages or detours as this is the only road connection to the largest monastery in Bulgaria. Groma Hold’s team worked in extremely complicated conditions in order not to interrupt traffic but instead move it to the lane which was not scheduled to be paved on that particular day to make it easier to travelers. On weekends construction work was halted so as not to inconvenience visitors to the monastery compound. More than 150 workers and 100 units of machinery were involved in the rehabilitation and reconstruction of this 20-kilometer section of the road which is the only transport connection for the villages of Padala and Pastra of the Rila Municipality to the Municipal Center and the town of Rila and Rila Monastery’s only road connection to the Sofia – Kulata I-1/Е-79 highway. The road was originally built in 1970 and had not been extensively repaired since. The construction and installation works were performed by DZZD Groma Hold Ltd.. The contract was worth BGN 14,128,475.47 VAT included. Construction supervision was entrusted to Transkonsult BG OOD under a separate contract worth BGN 222,180 inclusive of VAT. Designer supervision was performed by Putproekt 2000 OOD under a contract for BGN 17,280. The overall price of the BG16RFOP001-7.001-0014 Project, Lot 15 Road III-107 Rila – Rila Monastery Kilometer 11+010 to Kilometer 30+792,57, Total Length 19.782 km, Kyustendil Province was BGN 14,538,719.14 inclusive of VAT. 85 % of the funding or BGN 12,344,250.15 was provided by the EU, 15 % or BGN 2,178,397.09 including VAT came from the National Budget and the remaining BGN 16,071.90 including VAT came as own contribution.